There are many spills and substances that make contact with your commercial carpets that are often easily remedied with professional carpet cleaning. Where many businesses, especially those that see a lot of foot traffic, often manage their clean carpets by scheduling a deep carpet cleaning every 3-12 months, there are some spots and stains that cannot be removed with deep professional cleaning alone. 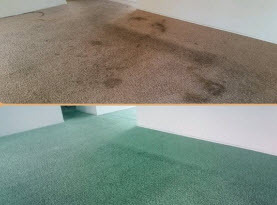 Bleach, or bleach based products coming into contact with your commercial carpets is a prime example of how removal can be a lot more involved and we at Carpet Dye-Tech would like to take an opportunity elaborate briefly on this subject. Does Bleach Change the Color of Carpets? For starters, to understand how bleach and related chemicals react to carpets, you need a quick rundown of the basic concepts. Bleach actually does not “stain” carpets. Stains suggest that a substance is either coating the fibers or have absorbed into the fibers to alter the color. Bleach does, essentially, the opposite. Bleach is a chemical that eats away the dye molecules. After the dye is eaten away, there is no color left (if left on long enough), leaving the carpet almost white. 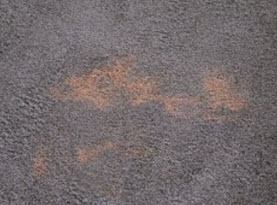 Once the bleach has done its damage, the color of the carpet is dissolved, leaving the business owner with a spot of different colors (orange, yellow or white) depending on how dark the carpet is and how concentrated the bleach is as well as how long it was left on the carpet. These bleach spots cannot be removed by blotting with water or vinegar. 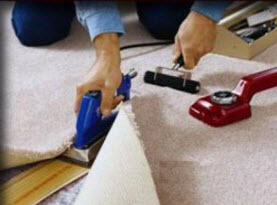 It takes a trained professional to effectively restore the carpet. Professionals, such as from Carpet Dye-Tech, take the time to masterfully match the exact shade of your commercial carpets and manually dye the carpets’ bleach spots. 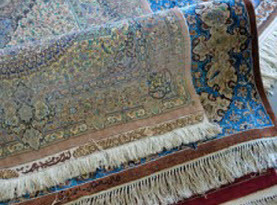 Following the matching procedure, experts will use advanced technological products, equipment, and techniques to completely, and seamlessly, re-color the carpets, leaving them looking as if the bleach incident never occurred. Commercial establishments rely on heavily on presentation, whether you are hotel, retail store, a school, or even a church. Where few may over look these eyesores, the overall presentation of your commercial space will significantly drop, no matter immaculate the surrounding area is. Instead of spending hundreds, if not thousands to replace the bleach riddled carpets, a professional bleach spot repair service from a qualified technician saves you money and restores the carpets efficiently. When you need to save your carpets from bleach spots to impress your visitors, you need the specialists of Carpet Dye-Tech to deliver superior results. Our experts are trained, experienced, and skilled in the trade. With our talents and the use of finely tuned equipment and quality products, we will restore your carpets. After we have expertly matched the current color, and any pattern colors, we will go to work and fill in the bleach spots to the pre-existing carpet color to make your carpets stunning once again. If bleach or bleach based products spill on your commercial carpets, use a damp cloth (white) to absorb as much as bleach as possible and slow the process. Then immediately call Carpet Dye-Tech to make the necessary repairs and restore your commercial carpet.